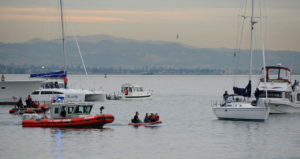 SF Giants fans are in for a super season of fun and adventure on-board their own Angel Island Ferry’s SF Giants Home Game Private Charter to McCovey Cove. Plan a Private Charter to catch a SF Giants Home Game in McCovey Cove. Be where the excitement is. SF Giants Home Game McCovey Cove Private Charters depart out of Angel Island Ferry’s Tiburon, California dock and travel to McCovey Cove. Angel Island Ferry SF Giants Home Game Private Charters anchor in McCovey Cove for cruisers to watch the game on flat screen TVs in comfort and style. Plan ahead for greater savings. 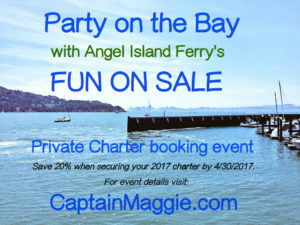 Check out Angel Island Ferry’s “FUN ON SALE” Private Charter Booking Incentive Event to save 20% off 2017 private charters when booked and secured with a deposit by April 30, 2017. For more information and to book your Angel Island Ferry’s Private Charter please call our business office at: 415.435.2131, or email us at: aiferry@angelislandferry.com. You can also call our Private Charter hotline at: 415.326.4188 for a call back within 24 hours.